Do your kids live and breathe Star Wars? Then they will enjoy this simple science activity that is perfect for warm spring and summer days. 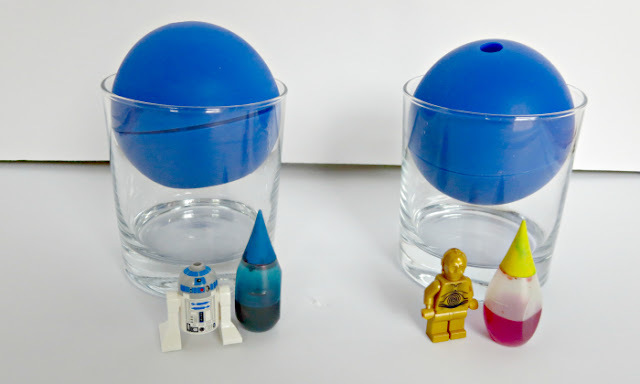 Blue Death Star will melt faster than a yellow one, because blue color will absorb more heat in comparison to a lighter yellow color. 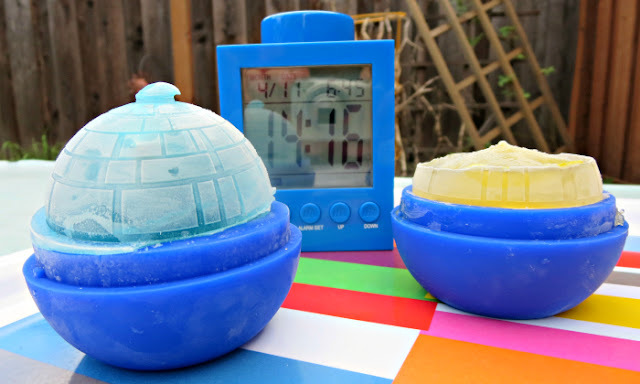 It will take less than an hour for both Death Stars to melt. That's what we ended up with when we pried apart silicon molds. 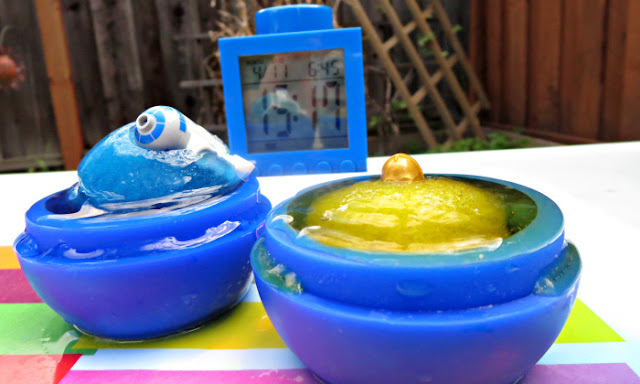 Both ice balls would not get out of their silicon bottoms, AND yellow mold apparently leaked, because I am pretty sure that I filled it up completely with a turkey baster through a hole on top. So much for checking which Death Star melts first. Also, frozen LEGO mini-figures ended up in very different places in the ice. I guess I should have secured them to the base if I wanted them to stay on the bottom. 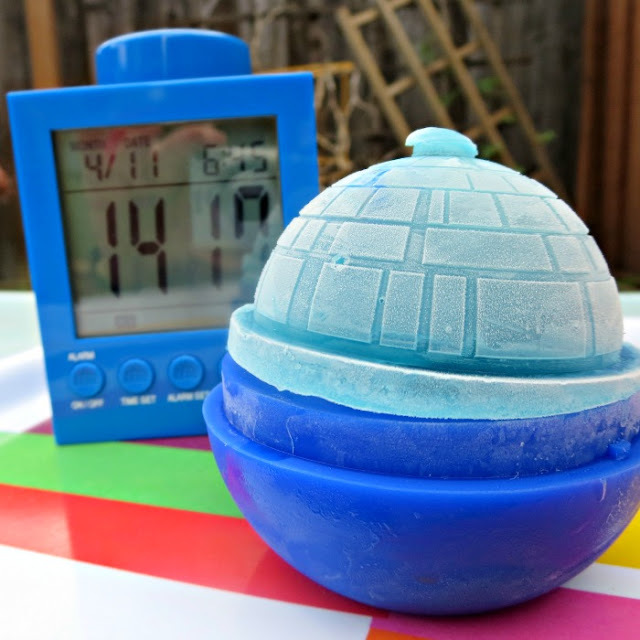 It was only in upper 70s on the day we attempted to melt our Death Stars, so we were not even close in melting them completely when one hour passed. We had to stop our experiment at this point, because we needed to leave house for an event. It would be interesting to have another try (hopefully with both Stars fully formed!) once it gets hotter here again. What kind of science fun have you done outside lately? More Science Activities for Kids? Follow my States of Matter Pinterest board. 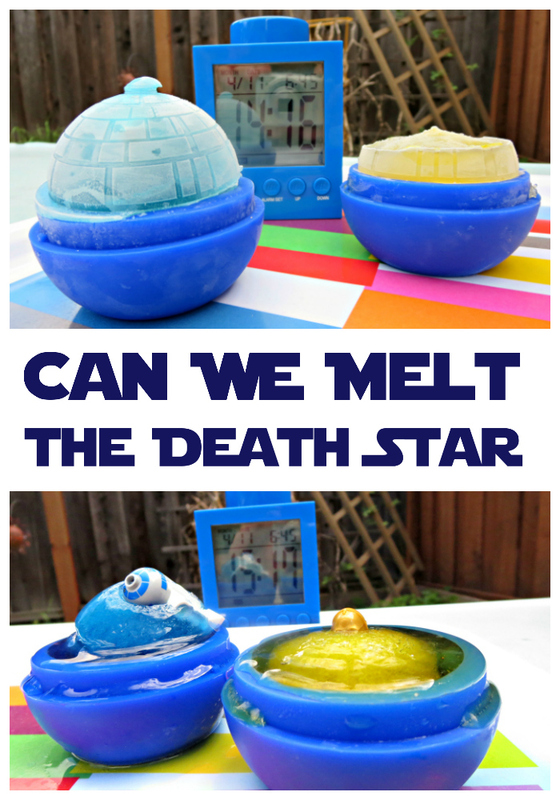 Ha ha ha ha ha, now I kind of wish we had a Death Star mold. I have a Death Star tea diffuser. Littl'un just discovered Star Wars this year and would totally love this for the summer ... just need to find someone with a mould!